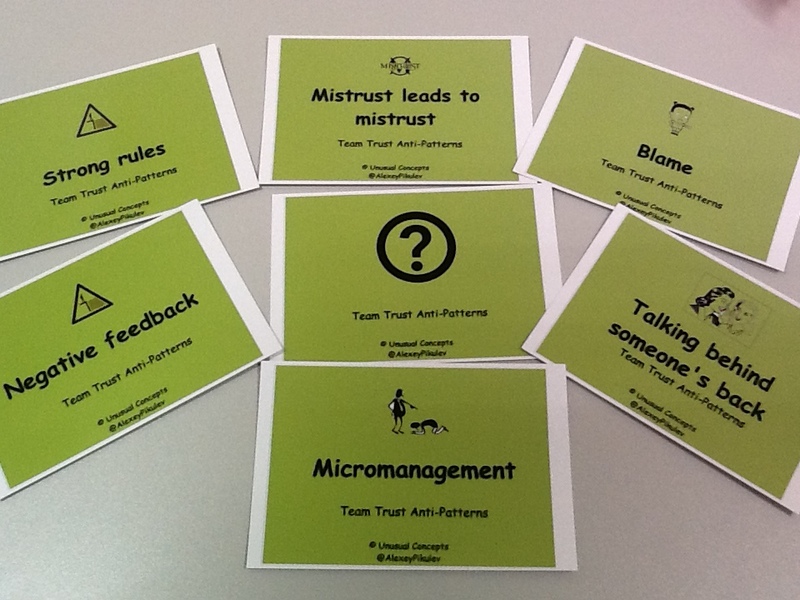 Trust Anti-pattern Cards – "In Team We Trust"
The main idea of anti-pattern cards was to create a tool for teams which teach them to deal with issues around trust. To help a team or whole organization overcome the trust trap, I crafted a set of anti-pattern cards. I was starting to collect a trust anti-patterns and today I’d like to present you my list. Let’s consider how you might use it below. Pick up a few anti-pattern cards that you need to consider. 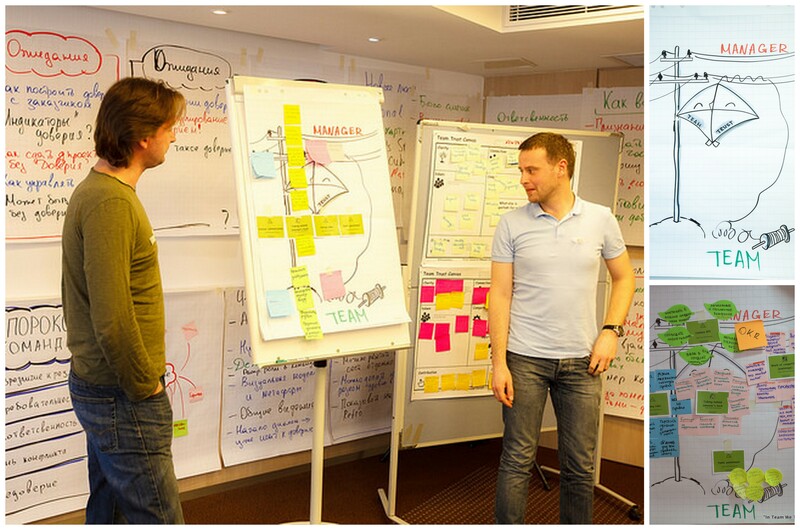 Give participants the opportunity to generate any ideas around it (silent brainstorm). Stick cards to the wall using tape. Look at them and discuss solutions. Use the cards as the headlines in a grid. Utilise it to consider different aspects and perspectives (for example from manager side, team and etc). Each column might represent ideas of how to handle this anti-pattern. Use flip-chart (or sticky tape) on walls to create timelines. Let the timeline demonstrate your team life cycle. 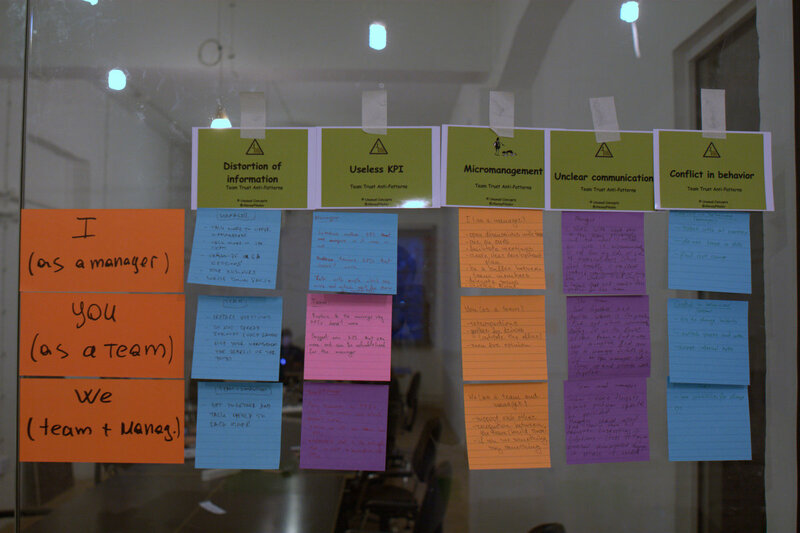 During the sprint (or project) team members can put a card on the timeline when he/she faces any issues. Then you will discuss it during retrospectives. Do you have any ideas how to apply it? Or maybe you have your own set of trust anti-patterns? Please, send to me or share it. Great idea Alexey.I really appreciate your sharing. Definitely I try it out. My version will be to print a set of similar cards for each team member and to establish three types Flip-chards on the wall: 1. I doesn’t exist in our team – 2. we experience at times, but on bearable extent – 3. are experiencing and it hurts us. Than I will ask all participants to bring their cards to FlipChart and divide their cards.Then we analyse just the 3rd FlipChard. Than in smaller groups I will ask them to let them develop strategies for possible solutions. It might work. Awesome! Please, let me know how it was. I’d like to right a blog post about it. It looks very interesting. I will try to use this exercise.